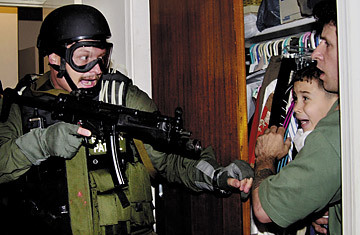 An armed INS agent confronts Elian Gonzalez, 6, and Donato Dalrymple, the fisherman who rescued surviving Cuban refugee rafter, in a closet during the infamous raid on April 22, 2000. Given all the genuinely weighty events of the intervening years, from 9/11 to the Iraq War and the election of our first black President, it's hard to imagine that a decade ago I and so many other journalists, as well as millions of rapt readers and viewers around the world, spent five months outside a modest house in Miami's Little Havana watching a six-year-old Cuban boy named Elián González. His media code name, we can reveal now, was The Rabbit  as in, "The Rabbit's out!"  which jaded television cameramen shouted whenever Elian stepped into the yard. Today, April 22, marks the 10th anniversary of the early morning raid by armed federal agents that finally snared The Rabbit and whisked him to his waiting father in Washington, D.C. Two months later the two were back in Cuba. That's where Elián should have been sent on Thanksgiving Day in 1999, when fishermen plucked him from the ocean off South Florida. He'd just been through a horrific episode: watching his mother Elizabet drown when the overcrowded boat smuggling them from Cuba capsized. But under international law, U.S. authorities were bound to restore him to his father, Juan Miguel González, in Cuba, even if that also meant returning him to Fidel Castro's communist society. Miami's hardline Cuban exile leaders weren't about to let that happen. So they installed Elian with his Little Havana relatives while dragging the debacle out in court to keep the spotlight on their anti-Castro rants as long as possible. Castro prolonged it as well  keeping the spotlight on his anti-U.S. rants as long as possible  by waiting more than four months to let Juan Miguel travel to the U.S. to claim Elián. The reason for this Cuban catastrophe was simple: because the Cold War's end had robbed them of their geopolitical influence, both the exiles and Castro saw this as a chance to make the rest of the world pay attention to them again, and neither side was ashamed to use a kid who played with Power Ranger toys. As one fed up Cuban-American told me, "They need this fight the way you and I need oxygen." And yet, despite how trivial the Elián episode now looks at a decade's distance  a possible inspiration for the reality TV craze that soon followed  it was arguably the kind of fight Americans need to see from time to time. For one thing, it slapped the country out of its post-Cold War smugness and reminded the U.S. that history was certainly not over, that ideological conflicts were and always would be alive and well in the world. (Al-Qaeda drove that home for us a year later, in case we weren't convinced.) But more important, it reaffirmed the rule of law and how reliable it usually is, or is supposed to be, in this nation more than in any other. That's especially important to consider today, when the kind of us-against-them anger that straddled the Florida Straits in 2000 envelops the entire nation in 2010. It's easy these days to envision an Elián-style standoff erupting anywhere in the U.S. And one probably will, given how angry President Obama makes conservatives and how exasperated right-wing idols like Sarah Palin make liberals. But when it does, there will at least be the Elián example, as well as clashes like the one over Terri Schiavo  and don't forget the 2000 presidential election recount, when Democrats rightly had to accept the Supreme Court ruling that ended that partisan mess  to show Americans that in the end people have got to back off and let the law prevail. While in Miami last weekend, former President Bill Clinton, who occupied the White House in 2000, defended his decision to enforce the law and forcibly give Elián back to his dad. "If I had said, 'I don't like Cuba and I don't care what the international law is,'" Clinton said, "then not only me but no other American President would have been able to say with a straight face, 'You can't kidnap [American children] and keep [them]'" in other countries. The U.S., to cite just one example, would have had greatly diminished standing last year when it demanded that Brazil return nine-year-old Sean Goldman to his father in New Jersey (which it did, in time for Christmas). Clinton didn't mention that he and his Attorney General, Janet Reno, a Miami native, waited five months to act because they hoped to avoid offending the powerful Cuban-exile voting bloc. But the Elián fiasco has since sapped that group of much of its political clout  because on the one hand it made Miami look like a rogue republic in the Everglades, and because on the other hand it so foolishly handed Castro what he was able to sell as a major victory. The only upside is that the drama brought a younger, more moderate Cuban-American cohort to the fore, one that understands how badly Washington's exile-driven policy of non-engagement with Cuba has failed to move the island toward democracy. As a result, there's been little if any observance of the raid's 10th anniversary this week in Miami. The Cuban-Americans who have come of age after Elián certainly don't regard April 22 as a day to celebrate; but most of them don't consider it a day to protest, either. They appreciate both the passionate politics that started the event and the dispassionate law that ended it. As part of its own commemoration, Cuba tried to goad them this month by releasing photos of 16-year-old Elian dressed in his Young Communist uniform. To their credit, Cuban-Americans didn't take the bait. Miami may have lost The Rabbit 10 years ago, but since then it's gained a deeper regard for the rule of law.